Two years ago, my wife and I welcomed our son Everett into the world. His first year of life gifted us with many wonderful memories and was a whirlwind of emotions: exhaustion, elation, anxiety, wonder, sadness, happiness, frustration, and love. 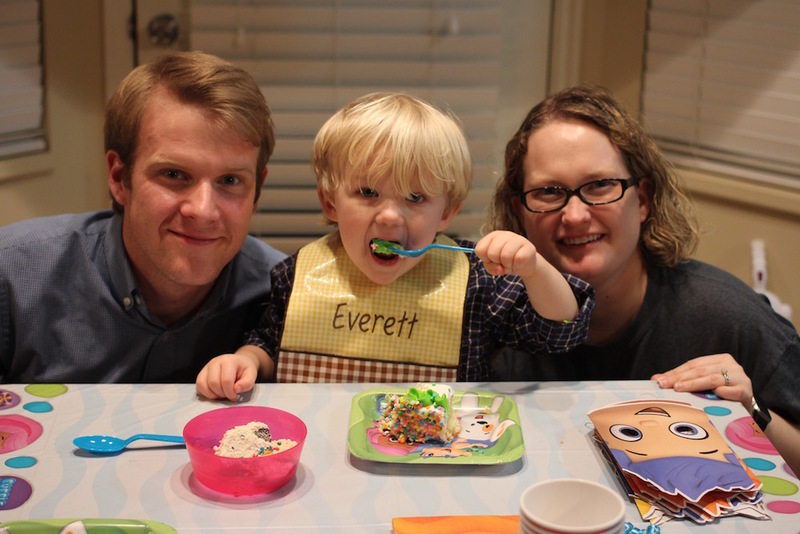 I wrote about our time as new parents last year on the occasion of Everett’s first birthday. The pace of life is unsettlingly fast, and so I find myself writing today on his second birthday. Two years is a strange birthday. It feels like the beginning of some unspoken transition. In the early years, the child is like a newly planted flower. You tend to the flower constantly and fear that the slightest wind will jeopardize its chances at survival. The flower does not exist in final form, but lives as some unrealized potential. Then one day you look away for a second and notice upon return that the flower is now there with slowly expanding petals. While you will always care for the flower and fret about its well-being, you feel more free to take a step back to watch it bloom and to appreciate its beauty. Our flower is blooming and it is so very beautiful. This is the rare quote where the words are able to express the wordless feelings in our mind. So it is, my heart has been outside of my body for two years. Just as my son has grown over the preceding twelve months, so too has my heart. When my son took his first steps with a prideful grin, my heart was filled with pride. As my son looked at the pictures of friends and family members when we moved across the country - smiling, but with a bitter sweet undercurrent resting just below the surface of his eyes - my heart became nostalgic. On the day we first dropped him off at a new preschool in a new state and he cried while staring deeply into my eyes with hurt, my heart broke. On the day I dropped him off and he smiled at me and then walked into his class, my heart smiled. And on the day I dropped him off and he no longer looked back, my heart again broke. Every bump, bruise, and disappointment was my heart’s ache. Every success, milestone, and discovery was my heart’s glee. As my son begins to understand that other people matter and that their feelings are important, as he tells us when a character on his favorite show is sad or happy, my heart’s capacity for empathy grows. Indeed, my heart walks around outside of my body. That heart makes me feel so many things. I love that. That heart teaches me so many things. I love that. My wife feels the same and we are both better for it every day. We are so very proud that Everett is becoming a polite, empathetic, kind, sweet, stubborn, rambunctious, and independent person. And we love him.